Grand Slam draws don’t get much tougher than the one Milos Raonic was served at the Australian Open this year, but just days after a pristine win over Nick Kyrgios, he’s done it again – this time downing 2014 champ Stan Wawrinka in the second round. In what was one of the most eagerly anticipated matches of a blockbuster Day 4 in Melbourne, the battle of former World No. 3’s did not disappoint. In a tense, high-quality encounter, Raonic emerged victorious 6-7(4), 7-6(6), 7-6(11), 7-6(5) after just over four hours. The margins in the match were as tight as the score, with all four sets decided by tiebreaks. Raonic appeared to have the edge for most of the first set, generating break points but being unable to capitalize. In the tiebreak, Wawrinka was able to turn the tide with the same one-handed backhand shotmaking that saw him claim the Australian Open title back in 2014. The proceeding sets saw the Swiss get a better read on the Raonic serve, breaking back after falling behind early on in the second set and increasing his dominance in baseline battles. But the script was flipped from the first set, as it was the 2016 semi-finalist Raonic who came from behind to level the match. = a 3️⃣rd set at the #AusOpen. Wawrinka and Raonic would play a nail-biter third-set tiebreak, with both players putting on a masterclass of tactical serving, but in the end it was a loose Wawrinka forehand into the net that would give the two-sets-to-one advantage to Raonic. Going down a break in the sixth game of the fourth, the Canadian found himself on the cusp of heading to a fifth set with three-time Grand Slam champion Wawrinka.With his back against the wall, Raonic was able to – somewhat miraculously given the quality of his opponent’s serving – find a break back as Wawrinka served for the set. In the fourth consecutive tiebreak, fortune favoured Raonic, who ran around the right forehands to dictate play and claim victory in the longest match of his career. Up next, other than a long, long ice bath, is Pierre-Hugues Herbert of France who upset last year’s surprise semi-finalist Hyeon Chung in four sets. Earlier in the day, Bianca Andreescu’s remarkable January breakthrough at the top level of the game came to an end at the hands of crafty veteran Anatasija Sevastova. Unable to find her range early on, Andreescu was broken in the seventh game of the first set, with Sevastova having little troubles closing it out to earn a set advantage. The Canadian, however, mustered the form she had been playing with over the past two weeks to storm back and claim the second after recovering from a break down. 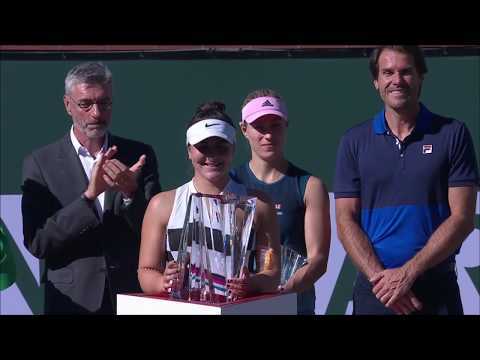 The two would play each other tight, exchanging nervy breaks of serve as Sevastova struggled to find her confidence and Andreescu, her breath. Several lung-sucking rallies appeared to drain the last of the 18-year-old’s reserves, as she quickly succumbed to the Latvian’s consistency, 6-3, 3-6, 6-2. After coming through qualifying and reaching the second round, Andreescu’s ranking will skyrocket as she becomes the fifth Canadian currently ranked in the Top 100.